A friend of mine gave me a sample of a beautiful, partially constructed card which I completed with stamps from the Herb Expressions ® stamp set. I coloured it using an Aquapen ® and Close to Cocoa Classic Ink ®. 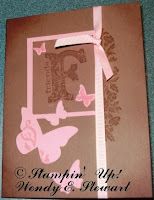 The card front has been dry embossed using Sissix Texturz ® Stampin' Up!™ Backgrounds 1 ® using Close to Cocoa cardstock. So Saffron is matted under Very Vanilla. The Kraft Taffeta Ribbon adds a subtle embellishment over the greeting. Thanks, Cynthia Clarke-McKellar, for the great card! Well, Easter is only a month away, so I've started creating Easter cards. The Abundant Hope ® stamp set is from the Occasions ™ mini catalogue, which is valid until March 31st. This card uses Elegant Eggplant, So Saffron and our watercolor cardstock, along with Black Stazon ™ for the flower and Eggplant for the greeting. The flower is coloured using Blender Pen and Watercolor Pencils. I love this little family from the stamp set, Happy Together! It is coloured in with Watercolor Pencils and uses Old Olive as its base. As well, it uses More Mustard and Really Rust in layers for the greeting and the mattes. The white gel pen is used to add faux stitching after punching holes evenly around the elements. The new Scallop Trim Corner punch on a 2" square created the tag, with grosgrain ribbon bow added for a finishing touch. I've been hearing so much about FlowerSoft ™ that I ordered some to try out. The Hostess stamp set, Asian Artistry, is used for this card, along with Dazzling Diamonds for the dragonfly, to create a greeting card that can be used for multiple occasions. The Scallop Trim Border and Scallop Trim Corner punches were used on the So Saffron matte to bring the design up a notch. This card uses the same colour scheme as the Easter card above. One last little creation: a little birdhouse was constructed using the mini milk carton Sissix die. The scalloped roof uses the Scallop Edge punch. The bird uses the Extra Large Two-Step Bird Punch. Its fun to make and share. A different kind of Easter Basket! I was searching for new ideas and came across the Mini Milk Carton Container™ on a few sites. Several of them had special containers or holders for the mini milk cartons that were unique and inspired me to try them out. The mini milk cartons are made the cheerful Shades of Spring™ Designer Series Paper using the mini milk carton Sizzix ™die. I also used the Beautiful Wings Embosslits ™die for the butterflies and several of the Embosslits™ flowers to decorate the boxes. I'm not sure what stamp set the Just for You came from. I filled the cartons with paper wrapped candies and stapled the tops shut. I decorated over the staples using flowers and butterflies mounted with dimensionals and glue dots. Ribbons are grossgrain So Saffron™and Elegant Eggplant™. Here's another person's idea for a carrier. http://thestampingrounds.typepad.com/projects/2010/02/milk-carton-tote-tutorial.html. Of course, these items were completed before Valentine's Day -- just in time for gifting. I just didn't have the time to post them. Sorry! Maybe the ideas can be used for a special someone or for next year's event! Here's some goody bags with heart toppers. I used coordinating stamps and punchs, along with the Pinking Hearts Border© punch. Beary Best Friends© stamp set, along with Beary Best Times accessories was used to create a little friendship card between a guy and gal. There's also Sizzix© dies that coordinate with this set, which have special Valentines and Easter coordinated accessories. The Pillow Card© and Daisies #2 Dies© were used for the Real Red© bookmarks, which were made to hand out at a dinner party for a non-profit organization I work with. The daisies also had sparkles added, to add some glitz. The saying, in case you can't read it is from the Sense of Time stamp set: "Learn from yesterday, Live for today, Hope for tomorrow." The bottom of the heart reinforces the part that fits over the book page and is done by punching out a scallop circle, scoring it in quarters, then folding and fitting it over the heart's point. Ever since I upgraded to Windows 7, I can't use the combination keys to put registered trademarks™ and copyright© symbols into my blog. I'm working on it, though, so hope to resolve this little legal stickler!! I've been trying out stamping with our new shimmer paints, Champagne Mist, Frost White and Platinum. The attached card uses the Platinum and the Matchbox die cut box uses the Frost White. Both paints are water based, easy to clean up and create a gorgeous opaque effect when stamped onto darker cardstock. Both use the Vintage Vogue stamp set from the Stampin' Up!® Occasions Mini Catalogue. The flowers on the card are handcut from stamped images which used Brilliant Blue and Ballet Blue inks. The main cardstock is Brilliant Blue and Whisper White. The background on the white cardstock stamping is done using the Platinum Shimmer Paint. I've also used Green Galore for leaves on both the card, stamped from the same set on white card stock. I've used dimensionals to add some varying height to the flowers. There are silver eyelets in the two corners, where the Photo Corners in two sizes have been added. The greeting is placed on the Stampin' Up!® die cut, Two Tags. The Matchbox die cut box is decorated with Brocade Blue on Brilliant Blue, stamped with Frost White Shimmer Paint using the Matchbox Messages stamp. The greeting is also from the same set. The flowers are from the Vintage Vogue stamp set, again, cut out and mounted with dimensionals. The white taffeta ribbon holds the matchbox closed. Inside, labels are stamped using the Very Vintage wheel in Brocade Blue and placed on Hershey® nuggets (Yum!). A little something sweet for someone I'm sweet on!!! I've finally been able to pull together some cards for Valentine's Day, using new stamp sets! The card to the left uses Whisper White, Melon Mambo and Pumpkin Pie for its colour scheme. The white cardstock was put through the Big Shot with a Sizzix Texturz Heart dry-embossing plate. The stamp set, Love You Much, was used for the Love. There is Fine Cosmo glitter added to the flower and leaf and the "Love" was coloured in with Melon Mambo. Ribbon is 1/2" Polka-Dot Grosgrain Ribbon in Melon Mambo. The dry-embossed white heart images were shaded with a sponge dobber using the same colours as in the card, lightly brushing over the embossing and filling in the heart shape to bring emphasis to the subtle images. The Pretty in Pink and Rich Razzleberry card uses the Full Heart Punch, Small Heart Punch, Pinking Hearts Border Punch, Sweetheart stamp set and the Sweet Treat Heart-shaped cups for holding candy. It is decorated with 1/2" Polka-Dot Grosgrain Ribbon in Rich Razzleberry. A fun, little gift for a sweet friend! The next card uses the Love Bug hostess stamp set, Whisper White, Bermuda Bay and Melon Mambo cardstock. The dry embossed background of the Bermuda Bay cardstock uses Texture Plates Kit #4, a hatched pattern. The Kangaroo card uses the Build-a-Roo 2-step stamping technique. It has been stamped on Soft Suede, then cut out, then coloured in Soft Suede to bring emphasis to the image. The hearts are die-cut using the Big Shot and the Hearts and Brackets die. The Bermuda Bay topper uses the Top Note die, which is folded in half. I stapled the two halves together to enclose the top of the goodie bag, then covered the staples with hearts in Pretty in Pink and Pixie Pink. The last card uses Vintage Vogue, a new stamp set in the Occasions Mini Catalogue. It uses Close to Cocoa and Pretty in Pink cardstocks and inks. The butterlies are dry embossing and cut using the Beautiful Wings Embosslits Die....now my favourite! A little colouring, using a Pretty in Pink marker allows some detailing on some of the butterflies. Grosgrain ribbon coordinates with the cardstock.